Is it important to you to do the whole thing? (Different ideas may be put forth as to what constitutes “the whole thing.”) Do you really want to get a Compostela—the certificate of completion? Do you view this as an athletic challenge or an opportunity to mortify the flesh? Would it violate your sense of accomplishment to pay someone to transport your luggage, to take an occasional bus or taxi, or now and then to stay in a plush hotel? Do you have any physical limitations that would keep you from walking every step of a predetermined trail? Options for getting the kind of Camino you want are almost limitless. Of course you can walk every step of the route you choose, carrying all your stuff, and staying in the humblest of accommodations. Or you can walk all the way while paying a transport service to carry your gear. Maybe you don’t mind using one mechanized form of transport or other to carry you, and that also is an available option. Plush hotels aren’t available everywhere, but every few days you might opt for one; in the meantime, reasonably comfortable and private lodging is usually available alongside the bunkhouse-like places. You can pay someone to make lodging reservations for you. If you feel too old, in too poor shape, have too many physical limitations, want the comeraderie of a group, or just don't like planning your own accommodations and transportation, you can hire a tour operator. Some will arrange for your lodgings and carry your luggage, others will carry you part of the distance and give you the opportunity to walk other parts, and still others will let you experience the entire route by motor coach. Which of the numerous options is the authentic Camino? Some rugged individuals who rough it the whole way inevitably will look down on those who don’t, but that’s to be tolerated. We’ve devoted a chapter in Second Wind relating to the phenomenon, reflecting kindly on those who experience the Camino in the way that is best for them. Preferences and abilities should be your guide in deciding what kind of Camino you want. Or become a "fluffy towel pilgrim"
There are many Caminos, but to most people the Camino is the Camino Frances—the French Route. Technically, it begins at LePuy en Velay in south-central France, and many people start their journey of 1,000 miles there. 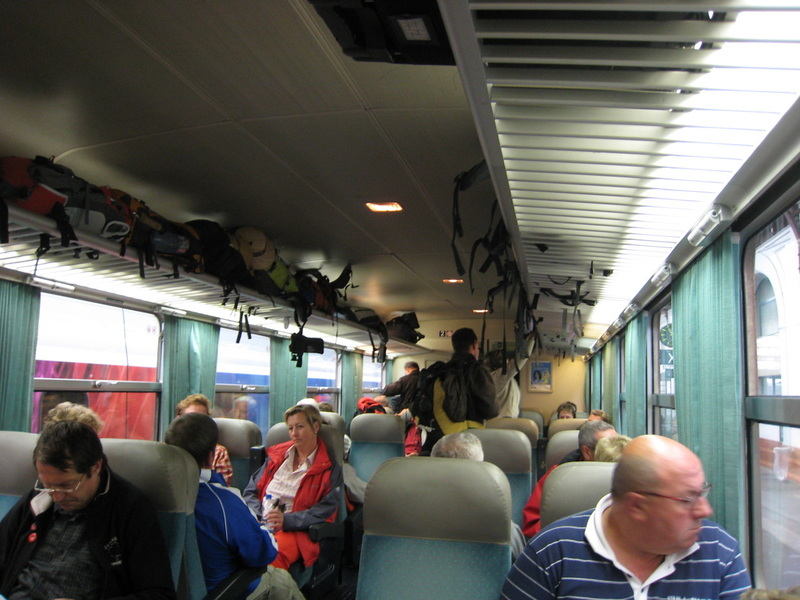 Many more people using the French Route begin in the Pyrenees. Many people begin walking in St. Jean Pied de Port on the French side of the Pyrenees and walk all the way to Santiago, without stopping except for occasional rest days. 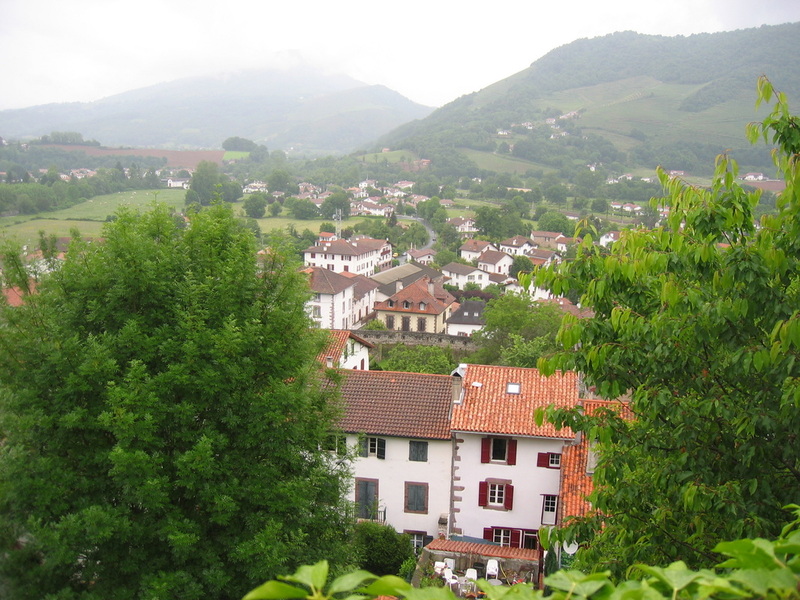 Others start in Roncesvalles, on the Spanish side of the Pyrenees and walk to Santiago. Many, particularly Europeans, walk out their front doors in Germany, Switzerland, France, or the low countries and walk to Santiago. Many others, like us, complete the distance by breaking their walks up into several-week segments. Still others, lacking the time to hike the whole distance, start at various intermediate cities and walk as far as they can in the time available. A large number of people begin in the city of Sarria, just over 60 miles from Santiago, and in walking that distance qualify for their Compostelas. Cyclists can cover much more territory than walkers, and they may adjust their distances accordingly. 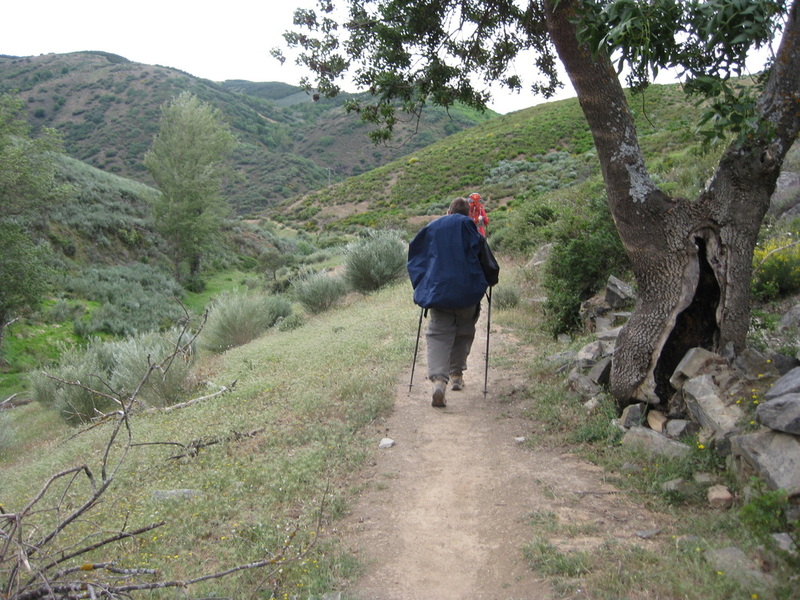 Much will depend on the kind of Camino you want (see above). Obviously limitations imposed by available time, available money, and physical ability must be taken into account. The increased popularity of the Camino has led to crowding and loss of mystique on the Camino Frances (French Route), and walkers have been encouraged to instead walk on one of the other routes. Following this advice, we decided to walk on part of the Via de la Plata in 2012. We enjoyed many of our experiences there, but we came away with the feeling that the route is probably not the best choice for first time walkers. The problem is lack of infrastructure. Towns are few and far between, choices of accommodations are limited, no comprehensive guidebook in English is available, and the local populations are less attuned to the needs of walkers. We expect that to a greater or lesser extent the other less-traveled routes would provide similar challenges. We walked six of our Caminos between mid-May and mid-June, and the other one in September. Many Americans avoid July and August because of crowding and the heat. Unfortunately, we experienced 90 degree days on the Via de la Plata in September of 2012, and had to stop walking for two days until the weather broke. In 2008 we experienced much rain, with days of muddy trails, damp clothing, wet footwear, and fog choked vistas. In 2013 we experienced cold and snow in the mountains in late May. Others who walked later reported oppressive heat. Weather is important when you’re walking outdoors much of every day, and there are no guarantees of good weather at any time of the year. Some experienced hikers prefer the colder months because of the solitude and dramatic winter scenery. The flip side of having the Camino to one’s self is that many accommodations are closed in the winter months. We have found we can average 20 kilometers (ca. 12 miles) a day, with allowances made for irregular distances between towns. Other people regularly average 30 kilometers (ca. 18 miles) each day, and some even more. We’ve noticed a tortoise and hare effect; we meet people who claim to be walking 30 kilometers a day and expect not to see them again, but then we do see them again and again. Quite possibly they are inclined to take more frequent rest days than we do. Once you estimate your average distance, you can calculate how much time you will need to complete your planned route. Conversely, if time is your limiting factor, you can figure out how far you can practically plan on walking. Rest days have to be factored in, of course. We’ve been inconsistent, but would prefer to build in a rest day every seven to 10 days. Of course many people would prefer to take their rest days in cities where there are places to go and things to do. Where you start and finish depends on how much time you have. (And money too—more later about how much you’ll need.) In the table posted here are examples of possible routes, approximate distances, and the projected time needed to complete the walk. It assumes you’ll want to finish in Santiago, but of course you can decide to walk any leg. Alone, with a friend, or with a group? 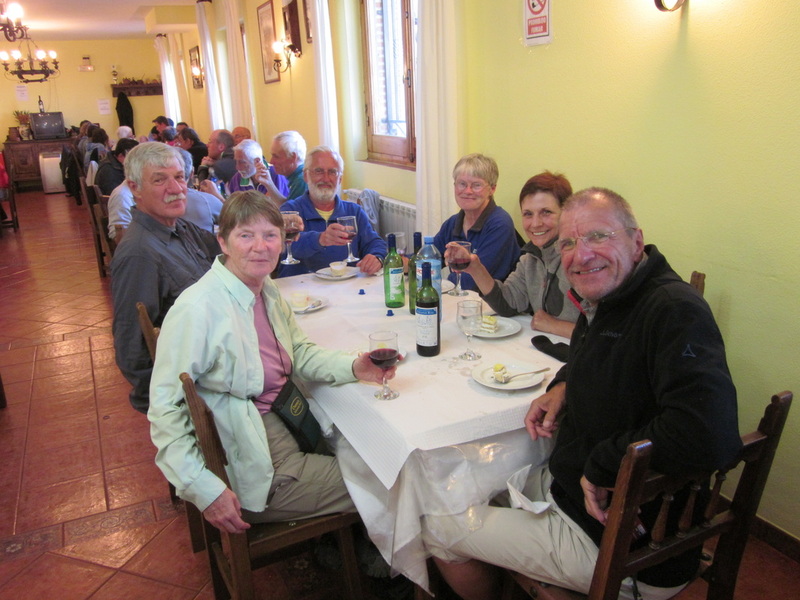 Before their first Camino, many people we spoke with assumed they would want to be walking with a group. This didn’t completely track with our experience. We had noticed that many people walk alone on the Camino. In France we found the majority of the other people we saw on the trail were walking solo. Particularly along the more traveled parts of the route, it is difficult to guess the numbers of solitary walkers because many probably pick up walking companions along the way. Eventually these groups might dissolve and reform, as each person finds his own speed and fulfills his need for company. The two of us have always walked together, but our experiences have led us to joke that “sometimes two is too many.” We have a tacit agreement that we need not walk in lockstep, and catching up hasn’t posed a problem. Two or more people would seem to seldom have identical preferred paces, and one may be always tending to forge ahead or fall behind. Groups can pose difficulties. One member might be tired, and anxious to quit for the day, while the others are eager to continue on. No surprise there, but little problems and inconveniences may become more serious as groups get larger or circumstances become more serious. Suppose in a group of four one gets a blister or becomes ill and decides she cannot go on. Do the other three agree to sit out for a day or two while their companion recovers? Or do they leave their colleague behind, wondering whether and when she will be able to catch up? What if the available lodgings in a town can accommodate only two of a group of seven? Do they split up, or do they all walk on to the next town? Annoyances may be magnified in groups, and there are many examples of groups that split up over minor disputes. The two questions we are asked most often are: 1) Isn’t it best to go with a group? And, 2) Is it safe for women to walk alone? The answers are: 1) Maybe, but be careful, and, 2) Yes. Keep in mind that walking with a group may limit your opportunities to meet new people, which is one of the most rewarding experiences of the Camino. There may be a little group out there just waiting to welcome you in. If you get tired of them you can go look for another group to join. Your starting point and perhaps your ending point usually have a lot to do with logistics—you have to be able to get there or get back from there. Most North Americans fly into Madrid, or sometimes Paris. Getting to St. Jean Pied du Port from Madrid involves a train trip to Pamplona, a bus trip to Roncesvalles and another bus trip to SJPP. Alternatively, some take a taxi all the way from Pamplona to SJPP or from Roncesvalles to SJPP. Getting there from Paris involves at least two trains, with limited schedules. 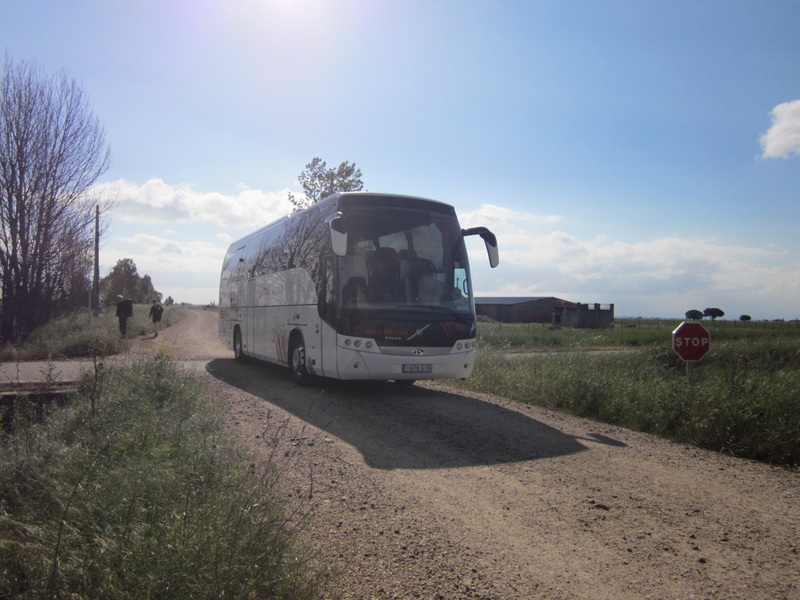 Getting to most cities along the route in Spain is easier, although not as simple as one might hope. Before planning on starting in a particular location, be sure to find out if you can get there with a minimum of difficulty. It is best to make your train reservations before leaving the U.S. 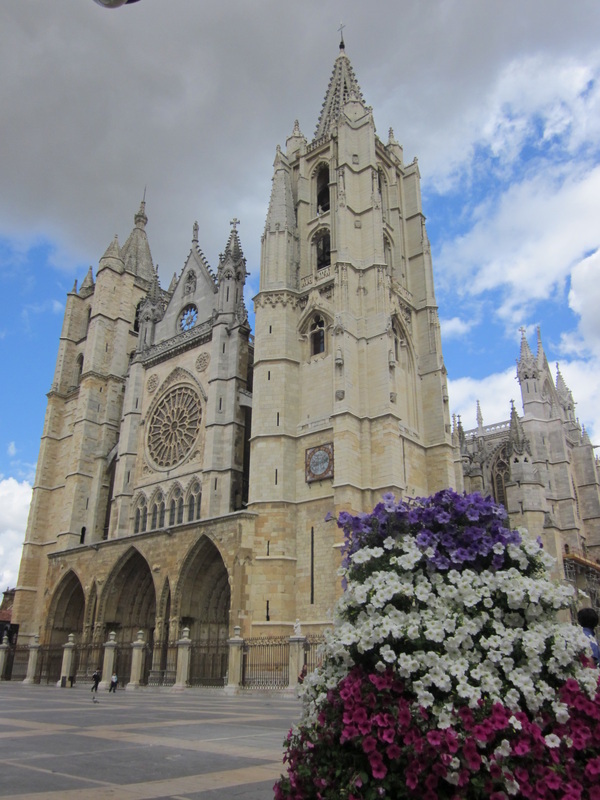 Some helpful links are RENFE, the Spanish rail system , SNCF, the French rail system, RailEurope, a consolidator that will usually tack on extra fees , and a helpful transportation page maintained by the American Pilgrims on the Camino. RENFE also has an app. Trains may be rapid and convenient between certain locations. 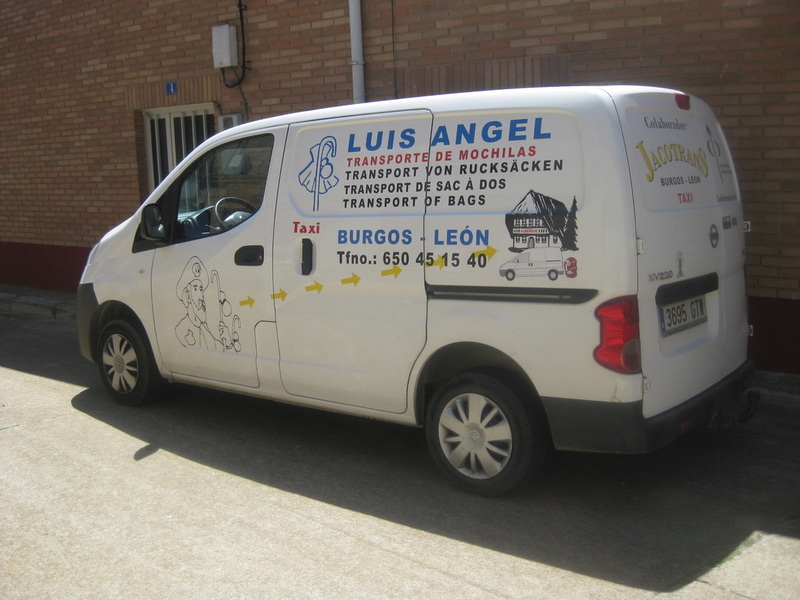 Our trips, in 2008 and again in 2011, between Pamplona and Madrid were fast and enjoyable. But we found the train in 2012 from Zamora to Madrid to be surprisingly uncomfortable and unpleasant. That train originated in Santiago and had many tired pilgrims on it. It kept being shunted to side rails to wait for…we never figured out what. 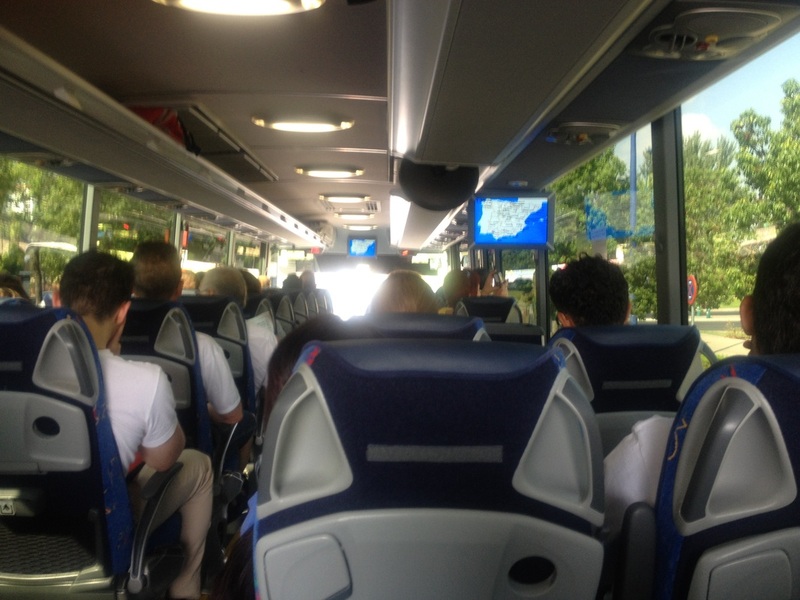 The experience caused us to want to carefully explore all options…train, bus, and plane before choosing our transportation. In 2009 and 2013 we chose to fly from Santiago to Madrid . It gave us full extra days in Santiago, instead of on a bus or train. If you fly one of the discount airlines, the prices are comparable. If you fly Iberia, it costs more but you capture the extra time in Santiago. The American Pilgrims transportation page has links to airlines that operate in Spain. Express buses are often the most direct, comfortable, and inexpensive options, provided you can find one that takes you where you want to go. Taxis or local buses may get you to a transportation hub, but it is better to plan ahead. ALSA is a major Spanish bus line, and Movelia is a consolidator that sells tickets for several bus lines. ALSA also has an app. 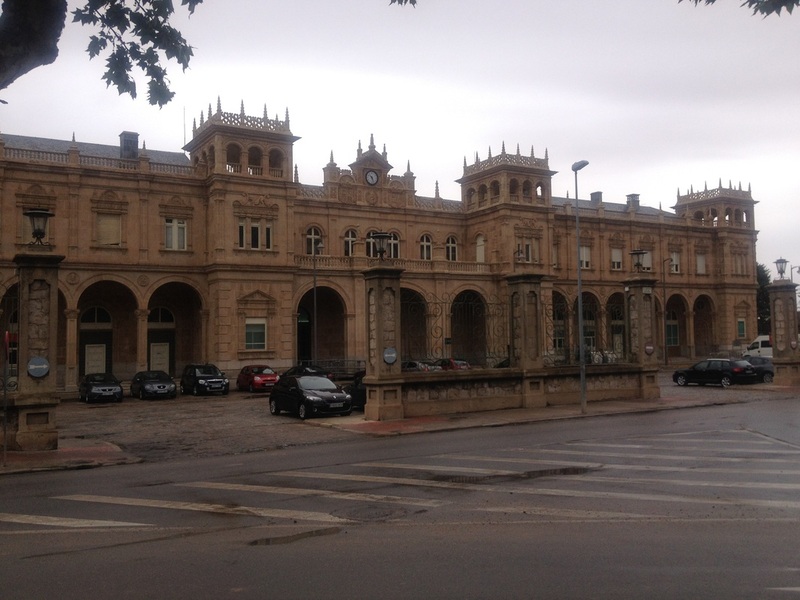 Your first challenge in Spain may be getting from the airport to the departure point of your train. 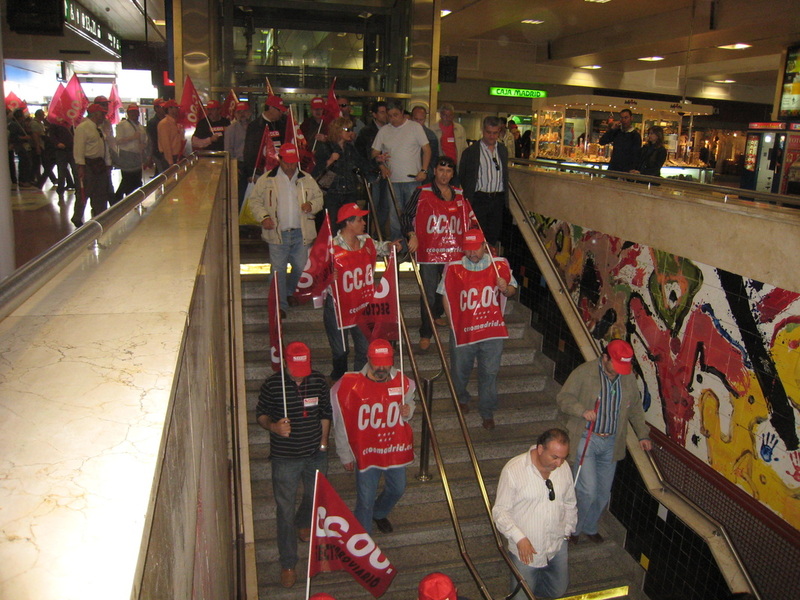 In 2009 we took the subway from the airport to the Chamartin railway station. We had to change twice before reaching the station and to be alert not to miss our stops. In 2011 we would be leaving from the Atocha station and were prepared to go to the subway route again. By chance we discovered at an information kiosk that there is an inexpensive shuttle bus that brings you there simply and rapidly. In 2013 we learned of a light rail, called Cercanias, that runs from the airport’s Terminal 4 to Chamartin. Before our first Camino we had been told that if you ever get in trouble on the trail, all you have to do is call a taxi. One of our first days out, we were having breakfast with a British couple at our casa rural. The man told us, with a glint in his eye, to be wary because before we reached Santiago would surely meet the devil―and he would appear the form of a taxi. Even if you are ready to make a bargain with the taxi-devil, it isn’t quite that simple, of course. Taxis are widely available, but you need a phone that works from wherever you are on the trail, you need to know what number to call, and you need to know where you want to go. If you’re in a town you can ask in a business or lodging, but as in all aspects of securing transportation, some advance planning may help.